perumAL SrIman nArAyaNan is leader and master of everyone. No one can order HIM. HE is independent and cannot be stopped nor misdirected. Hence, in order for a person to attain HIM, there are many ways as laid out by SAshthras including the likes of karma yOgam, gyAna yOgam, bhakti yOgam etc. One who does not know the nuances and subtleties of shAshthrAs try to reach perumAL through these aforementioned ways and strive harder in their attempts. There is a truth that is being told that is directed towards those people. Unless perumAL HIMSELF grants HIS lotus feet to these people, there is no way that they are going to reach HIM through their own actions. Hence, aruLALa perumAL emberumAnAr advices that let us all seek out and yearn for the moment when HE HIMSELF is ready to offer HIS lotus feet to us. karumaththAl gyAnaththAl kANum vagai uNdO? kANum vagai uNdO? – will not fetch the lotus feet of perumAL. Will it? karumaththAl gyAnaththAl kANum vagai undo? : Can a person reach the lotus feet of perumAL using his own efforts like karma yOgam, gyAna yOgam and bhakthi yOgam? No is the answer. bhakthi is automatically included in “gyAnam”. bhakthi is nothing but the highest point of “gyAnam”. The three ways including karma yOgam, bhakthi yOgam and gyAna yOgam are prescribed as per vEdhantha scriptures, to reach perumAL. janaka, the father of sIthA pirAtti, is said to have attained perumAL’s lotus feet via karma yOgam. In bhagavadh gIthai, it is said that there is no other way purer than gyAna yOgam. krishnA had told arjunA, “If a person wants to reach ME, he should keep his mind and heart towards me and should constantly think about me without losing concenteration even for a split second. HE should worship me”. So, we would get a question, then why does aruLALa perumAL emberumAnAr says “ivaRRAl kANum vagai uNdO”? This needs be examined. aruLALa perumAL emberumAnAr knows the exact nature of these aforementioned ways to reach perumAL. He knew this because of his knowledge that he got from emberumAnAr. So he said it. These ways are ways where one needs to follow after doing total surrender at perumAL’s lotus feet. So it is clear that the surrender that they do stands as a supporting element of their actions. Hence it goes without saying that these ways that are being done using one’s own effort, has to have the support of “surrender” (SaraNAgathi). So, even these ways of reaching perumAL are done using the help of SaraNAgathi. So one cannot attain perumaL purely with these ways as the only ways because these ways needs something else in order for it to be successful. If a person does not do SaraNAgathi, then whatever means he follow, be it karma yOgam or gyAna yogam, nothing will fructify because the essential prerequisite , i.e., SaraNAgathi is not being performed as the first step. This message is highly secretive in the advices that are being given by vEdhAntha scriptures. aruLALa perumAL emberumAnAr, with the grace of emberumAnAr, blesses all of us with this special meaning in this pAsuram. These two quote reinforce that there is no way out apart from SrIman nArAyaNan’s lotus feet. tharum aththAl anRi iRai thALgaL: This phrase needs to be read as “iRai thALgaL tharum aththAl anRi”. This would mean that perumaL SrIman nArAyaNan’s lotus feet would automatically give itself to us and there is nothing else apart from this. This bolsters the point that perumAL’s lotus feet is the sole refuge. This is what is being illustrated in mumukshuppadi chUrnikai “pirAttiyum avanum vidilum thiruvadigaL vidAdhu, thiNkazhalAi irukkum”. In this pAsuram, the name “iRai” would mean the ONE that is being referred in the first word of ashtAkshara mahA manthram (Om namO nArAyaNAya), i.e., akAram in the word “Om”. HE is none other than the ONE who is being referred by the “a” in the word “Om”. “thALgaL tharum aththAl anRi” means that the sole refuge for all of us is perumAL’s lotus feet and nothing else. This has been detailed in vEdhic scriptures. In dhvaya mahA manthram, we can see that in the first half of it, there is an exclusivity in “thiruvadigaLE SaraNamAgap paRRugirEn. nammAzhvAr says “ARenekku nin pAdhamE SaraNAgath thandhozhindhAi”, “kazhalgaL avaiyE SaraNAgak koNda”, “adimEl sEmamkoL then kurugUrch chatakOpan” and “charaNE charaN namakku”. We can see that he has said about the exclusivity of perumAL’s lotus feet as the sole refuge in many pAsurams and so are other AzhvArs. Hence there is literally nothing else apart from HIS lotus feet for a person to catch hold of. There are many examples that are being illustrated. orumaththAl munnIr kadaindhAn: Once upon a time, in dhEvalOkam, indhra ascended on his elephant “airAvadham” and was roaming. While doing so, he ran across dhurvAsa munivar who was having a garland that he got as prasAdham of SrI mahAlakshmi. dhurvAsa offered the garland to indira. indhra was not at all interested in it and so made the elephant “airAvadham” take the garland and destroy it. Agitated upon seeing this act of indhra, dhurvAsa gave a curse that all the wealth of indira be destroyed and his pride brought to ground. indhra’s entire wealth was obliterated in seconds. Not knowing what to do, indhra felt for his mistake and surrendered to the lotus feet of the supreme lord SrIman nArAyaNan. perumAL does not leave anyone who has fallen in HIS feet. HE churned the ocean with the vAsuki snake as the rope and mountain manthara as the rotating instrument. HE took the incarnation of a tortoise and bore the entire weight of the mountain. HE churned the unshakeable ocean that was a task that cannot be done by anyone. He churned as per the pAsuram “Ayiram thOLAl alai kadal kadaindhAn” (HE churned the wavy ocean with 1000 shoulders). A lot of wealth came from the churning process and perumAL gave them to indhra and restored his wealth. adaiththAn: sIthA pirAtti who was away from Sri rAma pirAn, was visibly sad. Sri rAma constructed a bridge across the ocean for the happiness of HIS wife sIthA pirAtti. HE constructed the bridge with the help of monkeys which would typically run helter-skelter if they see water in the first place. HE used big rocks to construct the bridge that was known as “sEthu” that cannot be fathomed by anyone. mudhal padaiththAn: During the time of cosmic deluge, all the living beings had no body, no shape and thus was in a state where they could have the sensation of happiness or sorrow. During that time, when everything was in that state, perumAL started creation one more time. 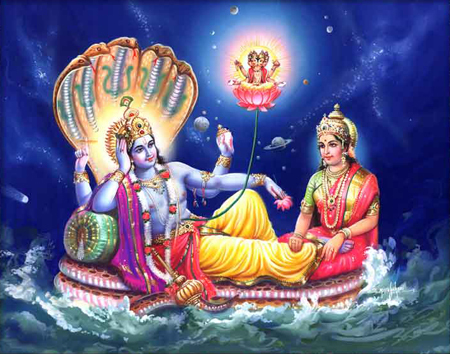 HE created the ocean, followed by the four faced brahmA and then everything. So it is water that HE created first. annIr amarndhAn: HE reclined on the ocean that HE created and protected everyone HE created. Some of the pAsurams like “veLLath thadankadaluL vidanAgaNai mEl maruvi”, ‘pArkadal yOga niththirai seydhAi”, “pArkadaluL payyath thuyinRa paraman”, “veLLa veLLAthin mEl oru pAmbai meththaiyAga viriththu adhan mElE kaLLa nidhdhirai koLgiRa mArgam” illustrate the state of perumAL wherein HE reclines on the ocean. Thus, the overall message is that whatever individual souls do on their own to reach lotus feet of SrIman nArAyaNan cannot be a means by itself. The means is nothing but the lotus feet of SrIman nArAyaNan HIMSELF. There is nothing else apart from that.